Frankly, I admire Kejriwal's turn towards politics (due to whatever ideologies: be it social service, money, fame or power). That's because I believe everyone has a right to one. Even more, in bad times, politics should be top priority of top class (on whatever basis) of a country. What I dont admire is the path chosen by Kejriwal. He could well change his party symbol from Jhaadu to "Pichkari" filled with "Kichad". His party has thrown more muck on others, more kichad on others but has gone abusive once facing the same. An old saying says, "जिनके घर काँच के होते हैं, वो दूसरों पर पत्थर नहीं फेंका करते". The eye-opening revealation of the MediaSarkar sting operation is about AAP's "funding", which is the most crucial root of political corruption. Kejriwal proudly announced that AAP has collected 20Cr and doesn't need more money, and that "its enough!". Post sting, the online donation turned out to be a farce. It is there for publicity and media creation. Real funding of AAP is happening through standard cash flow: no questions asked, no docs maintained. This has exposed AAP's inner working which wasn't known before. Shazia ilmi did not have great credentials to start with. However, the shocking revelation of this sting is Kumar Vishwas! I saw this man on NewsHour with Arnab and it was shattering. Threats, Abuses, Shouts, everything you expected from a learned poet had gone to bonkers. Statements like "we will write on vishwas letterhead and give as bill". Is this how bills are managed in art industry? Letterhead?? Obviously, he's neck deep in managing his own black money. I'd give thumbs up to AAP in learning basics of politics in such a short span of time. Modus operandi of Sonia Gandhi and Rahul Gandhi is quite close to how organised gangs are run. No public appearance, unless for showcases. No details of activities provided, except few which are beneficial for the gang. A good example of this is "Sonia Gandhi cries often for muslims, poor, tribals etc. In about 10 years of loot governance, not a single whistleblower against them has come up with any credible evidence. There confidential meetings have no leaks whatsoever, except planted ones. Only gangs manage their cadres so well that what goes out is "only good, rest is "managed". Their travels are unknown, religion unknown, health issues unknown, life history a mystery, sources of income and expenditures unknown. In a web of blackmail, "hail sonia" and mutual benefits, not a single officer and politician has turned eye against them. It is surprising that over $2 billion of assets are hidden, without any whereabouts or even investigation (link, sonia needs to come clear on her income). EC recently said that Social media is also under its purview. Even though 2 days before physical campaigns for election stop, however, campaigns on social media were running in full swing. 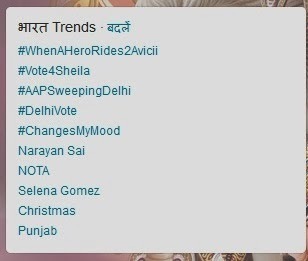 Below are the twitter trends for delhi election day 04 Dec 2013. As you can see, AAP and Congress were aggressively campaigning for couple of days including day of election. Delhi elections showed many issues. One person in crutches came to vote but was returned because his name was missing in voter list (link)! Few places were disallowing mobile phones, without any pre-notice (link). Sometimes, people are proactively running to election offices to get voter list updated (link). There are other clerical issues too (link, link). It is high time that Voter registration, Verification, Updation and most imp voter turnout be overhauled, researched and innovated.